San Juan Pueblo-Ohkay Owingeh, means “Village of the Strong People”. 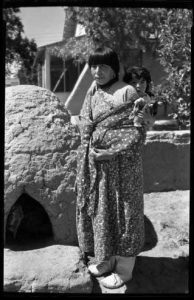 The language spoken by the San Juan Pueblo is Tewa. The first contact they had with the Spanish was in 1598, when Juan de Onate arrived on a survey exploration. The Spanish were impressed by the friendly people of the San Juan Pueblo. Onate named the pueblo San Juan de Caballeros (Saint John of the Gentlemen). The pueblo is located 30 miles north of Santa Fe, New Mexico it has been continuously inhabited for over 700 years. There are more than 100 of its original buildings that still survive (Gibson, Daniel, 2001). Famous potters for Ohkay Owingeh are Leonidas C. Tapia, Reyecita A. Trujillo, and Rosita Cata. Gibson, Daniel. Pueblo of the Rio Grande: A Visitors Guide. Tucson, AZ: Rio Nuevo Publishers. 2001. Boy oh boy where has the summer gone? The start of school is right around the corner! One good thing about working inside is, the museum is nice and cool! I would like to share what I have been up to on this part of my summer journey…. As I mentioned before in one of my post the museum committee was busy planning a fundraiser for the Salazar Rio Grande del Norte Center. I am happy to say that the fundraiser turned out to be a great event and brought in some money for the museum to continue with preservation, research, and internship opportunities for students. Thank you to all who supported the fundraiser. The display cases in the Mezzanine level are all completed and have wonderful artifacts for visitors to the museum to enjoy. 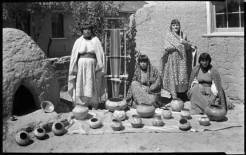 The museum was given a very large display case that now has the largest pot made by the Tewa’s on exhibit. I again extend an invitation to come and visit the museum. I see an end in sight to my file management project that I started at the beginning of summer. All I can say, I am very pleased with the way the files are looking…organized! This is something I want to complete before I leave my position as intern. The database is another project that I have been trying to get as much work done as possible. Little by little you see small parts of a big job falling into place.